Two days the summer pilgrims rest at Verinag, below the mountain pass. Then they toil on to Achibal, over the stony Sandrin river-bed, and up the rugged hill behind Shahabad, which is covered in the early summer with creamy peonies and the lovely Kashmir rose; the wild rose resembling masses of bright pink gorse so close the flowers, so prickly their stems. The temple of Martand, on the plateau above Islamabad, is the third place of pilgrimage; the splendid ruin through whose colonnade the ninety miles of valley can be seen. To the north, at the foot of the Martand plateau, is Bawan ; and far up, near the glaciers at the head of the Lidar River, lies Amarnath Cave, with its frozen spring representing Siva the Preserver. This is the goal of the pilgrimage, the whole object of all these weary months of marching. Here the poorer pilgrims turn homewards; and they are nearly all poor, these travellers by the old Jummu way. So they rarely journey farther down the main Kashmir valley, or see Srinagar, with its water-streets, its curiously carved shops and houses, its Imperial lake-side gardens, and its new well -laid roads. The same remark applies to quite another class of pilgrim, who, entering the valley at the opposite end, race up to Gulmarg ; and all that many of these pilgrims see of Kashmir is the forest, the faint glistening mountains of the Indus, and the smooth, green bowl-shaped meadow at their feet, where round and round the links they go, pursuing the British god of games. 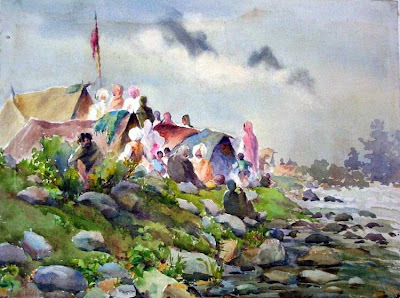 Image: (not from 'Gardens of the Great Mughals') A painting by Leila K. Williamson (c.1894-1914): "Pilgrims at Pahalgam, on the road to holy Amarnath,"